Cedric Peerman with his wife, Hagar, and children Emmaus, Ava and Isabelle (twins). 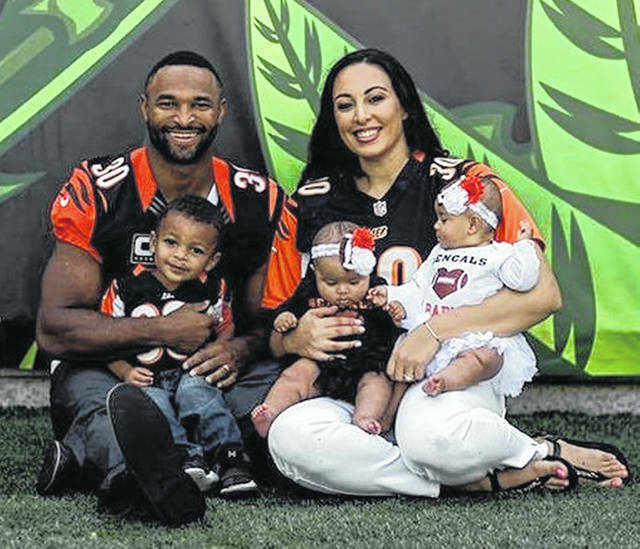 WILMINGTON — Cedric Peerman, a former Cincinnati Bengals running back and special teams captain, will be preaching at Calvary Baptist Church at 10:30 a.m. Sunday, April 14 at 1920 St. Rt. 22W. Cedric is now a licensed minister. His energy and leadership on and off the field resonated with his coaches, teammates, fans and opponents. Cedric will share the amazing story of how his life was changed when he allowed Jesus Christ to be his Guide. A native of Gladys, Va., Cedric attended William Campbell High School and played football, basketball and ran track. There he earned four state titles — one in football and three in track. He attended the University of Virginia on a full scholarship to play football. While there, God worked in his heart, giving him mentors, grace and mercy along the way, and he was saved. By God’s grace, Cedric graduated from UVa in 2008 with a degree in sociology, and in 2009 he was drafted by the Baltimore Ravens. From 2013-15 he was a Cincinnati Bengals team captain and elected to his first Pro Bowl in 2015. Cedric has accomplished many things in his life yet he considers everything he has gained as nothing compared to knowing Jesus Christ. Cedric has many dreams and goals that he wants to accomplish and looks forward to doing so with his wife and children by his side. However, his main desires are to love God, love His family and to love others.